I was tripping last night... wondering how the downwelling Kelvin that was generated from the late December/Early January WWB beneath the WPAC, disappeared. Kingarabian wrote: I was tripping last night... wondering how the downwelling Kelvin that was generated from the late December/Early January WWB beneath the WPAC, disappeared. So, contradictory tweets on the same day? I don't care what anyone says, I'm officially calling this "El Lame-o." It needs to either develop or go away. Something tells me we'd have to have +.5c 3.4 conditions for an entire year before they'd declare. At least this is the way it feels to me. SconnieCane wrote: So, contradictory tweets on the same day? I don't care what anyone says, I'm officially calling this "El Lame-o." No disrespect to Mr. Henson, but he's basing his reasoning in that tweet on a 1 week of Nino 3.4 dipping below +0.5C, but if you look at that graphic, Nino 3.4 has been at or over +0.5C for the majority of the time since this past summer. This tweet is also in regards to the ENSO event of 2018-2019. 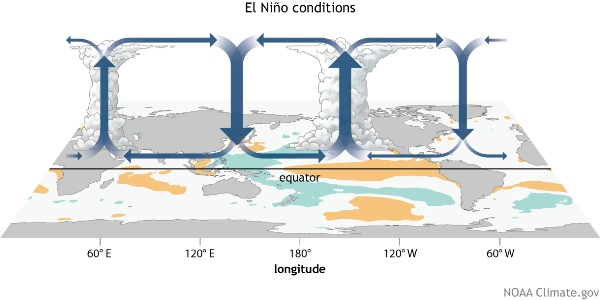 Paul Roundy's tweet is talking about progress towards a possible El Nino for that may have big impacts in 2019-2020. Sciencerocks wrote: Something tells me we'd have to have +.5c 3.4 conditions for an entire year before they'd declare. At least this is the way it feels to me. Even that may not be enough as long as they don't get the atmospheric coupling they're looking for. Buoys website is back online. Clear as day now that we have a new warm pool that is strengthening. Through January 18, the buoys snapshot of the subsurface matches closely with 2005 and 2015 so far. 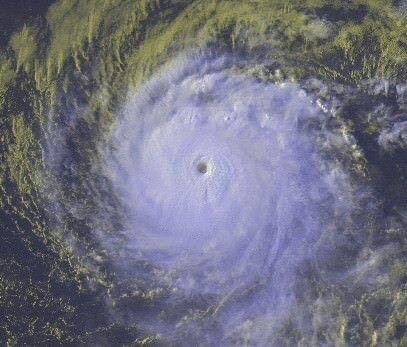 Both years were coming off El Nino's. Although the warm anomalies are stronger at this stage compared to 2005 and 2015. Kingarabian wrote: Buoys website is back online. Clear as day now that we have a new warm pool that is strengthening. Through January 18, the buoys snapshot of the subsurface matches closely with 2005 and 2015 so far. Both years were coming off El Nino's. Although the warm anomalies are stronger at this stage compared to 2005 and 2015. Here is the CPC 1/22/19 update that has Niño 3.4 up from +0.4C last week to +0.5C this week. Euro has the MJO in phase 5 but quickly takes it into phases 6 and 7. So not much time for the trades to do enough cooling at the subsurface to change things around. 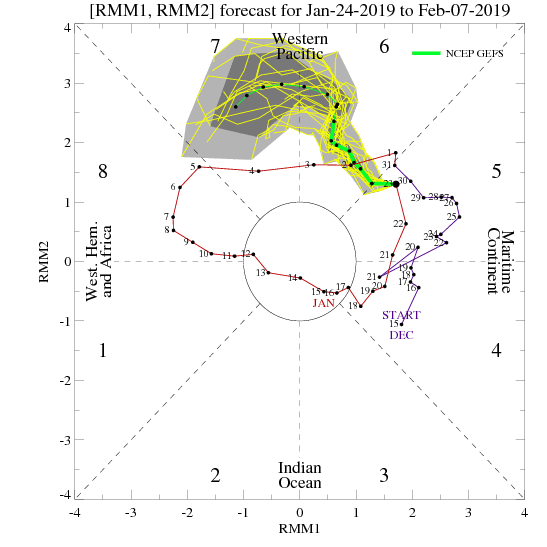 There are disagreements in the long range forecast between the GFS and Euro in just how long the MJO sticks in phase 7, but there are a handful of EPS member that amplify the MJO in phase 7. If that happens we could see another WWB. 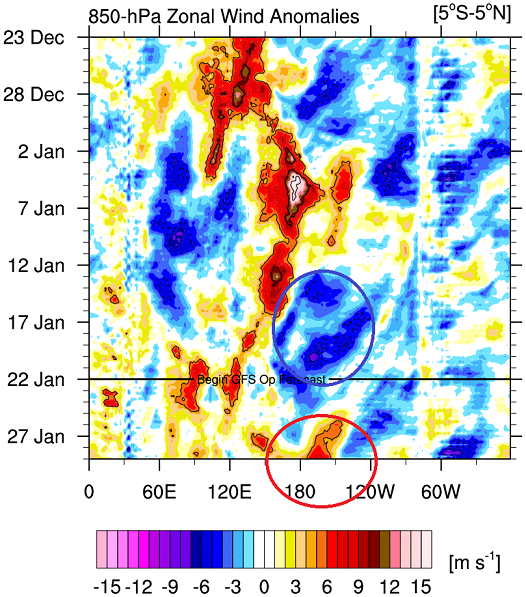 Does the GFS lose its head whenever the MJO enters phase 6/7? It's displaying a very strong MJO amplification in phase 7 once again. It did the same during late December/early-January only to correct lower. Subsurface pool is near the dateline now and this is pretty much where the anomalies peak or level off. Let's see if the anomalies warm further than +4C. The weekly CPC update has Niño 3.4 going down fromn +0.5C last week to +0.4C now.